In a move that can be best described with the phrase “Oh no he didn’t!” Final Fantasy XIII was announced at the end of the Microsoft Press Conference. Right when the show appeared to be over, the representative from Square Enix came back out and asked Don Mattrick if he could show him one more “movie”. The Final Fantasy XIII trailer rolled, and gamers jaws hit the floor. I’m interested to see how Sony will counter this one! I seriously cannot wait to get my hands on this game. Something not mentioned at todays press conference, but picked up later in a press release was interesting news of some new features coming to Xbox 360 and a PC near you! Play from hard drive. You’ll be able to copy game discs to your Xbox 360 hard drive. Installing the games will prevent wear ‘n tear on the disc drive, and will shorten load times. You will still need the disc in the disc tray to prove you own the game. 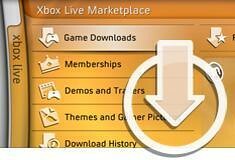 Access Xbox LIVE Marketplace on the Web. If you’re not near your Xbox 360, you can still use this “Internet” thing to browse and purchase things from the Marketplace. Once you purchase something from Xbox.com, it will download automatically to your console while you’re away. These features will hit with the Fall Dashboard update.